I’ve reviewed a lot of make money system scams lately, and realized that many affiliates promote them simply because they pay good money. 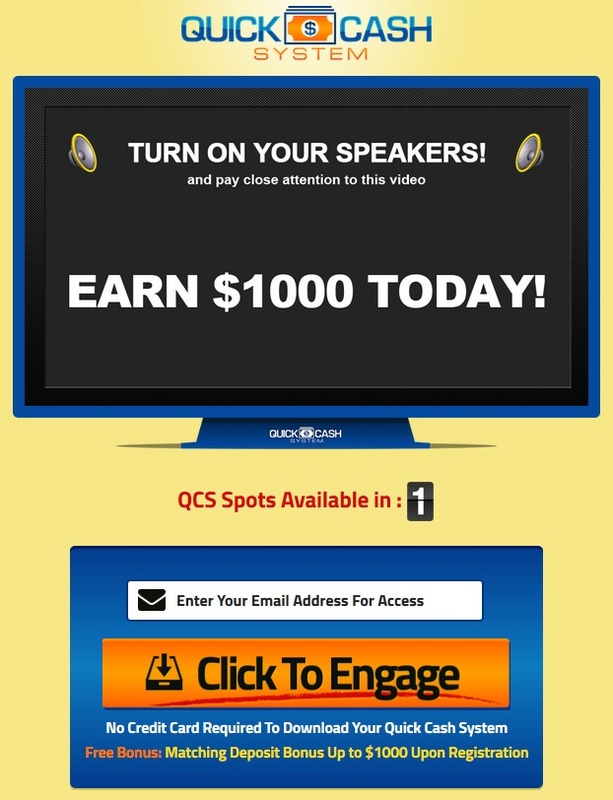 A single referral to the Quick Cash System can earn the affiliate more than $300. So, let us have an honest look at the Quick Cash System today, a program that claims to earn you $1M in 90 days. Is it possible? Is Quick Cash System a scam? The Quick Cash System homepage is neat and simple. There isn’t much distractions, just an auto-play video that showcases the daily life of Sarah Markel, the alleged owner who earned millions from Quick Cash System. In the video, Sarah talks about how the other binary trading systems are bogus and make you lose money over time. She parades around a big house in the video, and it’s very clear that she’s suggesting the Quick Cash System helped her afford the luxury residence that she’s showcasing to you. She claimed to have earned a great fortune from binary options using the Quick Cash System, an automated software that does all the trading for her. More importantly, she can help you do the same, quit your job within 24 hours and make you a millionaire in just 100 days! Not only that, she’s not even charging you a cent for the software! Did you really came across an opportunity of a lifetime? Not at all. The Quick Cash System is actually earning your money through commissions instead of the software. More on that later. To make sure everyone is on the same page, we’ll side track a bit and briefly explain how binary options work before we continue with the review. Binary options is gaining good momentum in recent years due to its simplicity, when compared to the more sophisticated trading instruments such as the stocks and forex. Instead of reading news and analyzing charts, you only need to choose one of two options in binary options (binary means two). You predict (guess) whether the price of an asset will rise or fall after a short period of time, usually between 30 seconds to 5 minutes. There can be only two outcomes – if the price is higher after 5 minutes and you are correct, you win a certain percentage of what you bet. If you’re wrong, you lose the entire sum. For instance, I predict that the price of a commodity will rise after 5 minutes, and I bet $50 on it. And let’s say I’ll earn 80% of the bet amount if my guess is correct. When the time is up, if the price is indeed higher, I’ll earn a good $40. However, if I’m wrong, I lose my $50. The odds are never in your favor. Even if you manage a 50% win rate, you will still lose money based on how binary trading works. Guessing-blindly, or using some binary trading robots that you don’t understand makes binary trading nothing more than gambling. Please note that we do not recommend binary options if you want to make serious money online. There are simply much better alternatives out there that are more predictable than trying to gamble your way to wealth. How Does the Quick Cash System Work? The Quick Cash System positions itself as a mathematically proven binary trading robot that helps you trade and earn money, without any effort from your part at all. Instead of choosing the options yourself, you let the robot decides the trades for you. However, Sarah Markel forgot to mention that you need to sign up with their affiliated binary options broker, and make a minimum of $200 deposit before you can start using their free software. You cannot use the software on any of your existing brokers. Apart from that, once you provide your email address on the homepage and enters the “members only” page, you’ll see another hard-sell video that talks about how you can’t afford to pass up the opportunity, only this time accompanied by a countdown timer. Is there a reason to use a countdown timer here? Yes there is. It’s there to make sure that you don’t have enough time to analyze rationally what Sarah Markel is pitching you, and to create an illusion of scarcity and a precious limited time offer. It is forcing you to do an impulse sign-up. But if you refresh the webpage, you’ll realize that the timer resets itself. It’s just a simple computer script that resets to 10 minutes every time you load the webpage. This tactic is widely used in online opportunity scams, such as The A to Z Cash System and Earn at Home Club scams that we’ve reviewed before. Be vigilant when you see a countdown timer like this next time. Is the opportunity too good to be true? If it is, it’s most likely a scam. Why is Quick Cash System Giving the Software Away for Free? Keep in mind that the Quick Cash System doesn’t earn your money from the software, instead it earns a boatload of ongoing commissions after you join their system. If you decide to join the Quick Cash System, you’ll be required to sign up with one of their affiliated binary options brokers. They earn a sum of referral fees right there once you make your initial deposit. I was assigned to Bloombex Options, but I’m sure there are other affiliated brokers. In my previous review of Free Money System, a program similar to the Quick Cash System, I was introduced to Glenridge Capital. They had the identical banner for the deposit page. Coupled with way they present the systems and the use of similar 10-minutes countdown timer, I’m sure that these two systems are actually promoting the same trading software. Anyway, after speaking to Bloombex’s support, I realized that the minimum deposit is $200 instead of the default $300 that Quick Cash System has determined for me. Quick Cash System wants you to deposit more money with their affiliated broker simply because you’ll be able to place more trades before your account gets depleted. And the team behind the Quick Cash System earns a commission every time you place a trade with their affiliated broker. Regardless of whether you win or lose money, the Quick Cash System will earn a commission off you. Since you are fully automating your trades using their software, the trading frequency is also determined by them. In short, they can fully control how much commission to earn, as long as you still have money in your trading account. Should I Try Quick Cash System? As we’ve said in the review earlier, we don’t recommend binary options as a way to make money online at all. It’s not that different from gambling, and using an automated trading software is no different. You are essentially putting your hopes and your entire investment in a piece of software that gambles on your behalf. You are more likely to end up losing all your money than making any significant profit. If you have some cash to spare for entertainment, you may go ahead and try it out. But you’ll be better off spending it on a nice dinner with your loved ones. Free Money System Review – Scam by Walter Green? Market Buster Review – Scam or Legit?